Which products contain microplastic ingredients and which not? In the below overview you can choose the country to find out if products in the respective country still contain microplastic ingredients or are free of them. Each NGO is responsible for the listing of cosmetic products on their national product list, except of the designation of the ZERO logo. Click on the NGO logo for more information about the NGO and their work on the issue of microplastic ingredients in cosmetics. Red*: Products on this list have been found to contain ingredients which are commonly considered to be microplastic ingredients. These include but are not limited to Polyethylene (PE), Polypropylene (PP), Polyethylene terephthalate (PET), Polymethyl methacrylate (PMMA) and Nylon (PA). *This data was correct at the time of entry. Please contact us with updated information. Orange*: Products on this list have been found to contain one or more of the following types of microplastic ingredients: Polyethylene (PE), Polypropylene (PP), Polyethylene terephthalate (PET), Polymethyl methacrylate (PMMA) and Nylon (PA). The producers have promised to phase out these microplastics from these products. During the period of reformulation, some products available in the shops may still contain microplastic ingredients. *During the period of reformulation, some products available in the shops may still contain microplastic ingredients. Please contact us with updated information. Green*: Products on this list do not contain any of the following microplastic ingredients: Polyethylene (PE), Polypropylene (PP), Polyethylene terephthalate (PET), Polymethyl methacrylate (PMMA) and Nylon (PA) but may contain other types of microplastic ingredients. We are asking the producers to update their commitments to make it clear whether or not any of their products contain any microplastic ingredients. *Products in this list were assessed for the presence of all microplastic ingredients and this data was correct at the time of entry. Please contact us with updated information. Zero: All products on this list are free from all known microplastic ingredients. Because the producer has verified this fact, this product carries a ‘Look for the Zero’ logo. The list of the 67 microplastics that have been checked in these products can be found here. 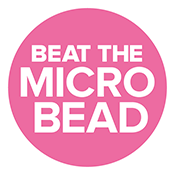 Does your brand want to be part of Beat the Microbead? Is something not accurate on this page, or did you find a brand that uses microplastic ingredients? Please fill out the contact form and let us know.